The distinctive Invicta watches with their classic dials and encased in one of the most beautiful metal cases ever to be seen are only the beginning of what will attract you to these the most elegant of dress watches. Renowned for refined quality in every aspect of watch design and manufacturing and in the business of distinctive watch making the Invicta S1 Rally is literally a work of art for your wrist with the name everyone with selective taste turns to when looking for a distinguished elegant watch. Each well-designed stainless steel case represents a sculpted almost one-of-a-kind classic beauty produced with only the very best of materials available in the watch universe today. The watch in the S1 Rally series is always associated with a sophisticated look and refined taste. 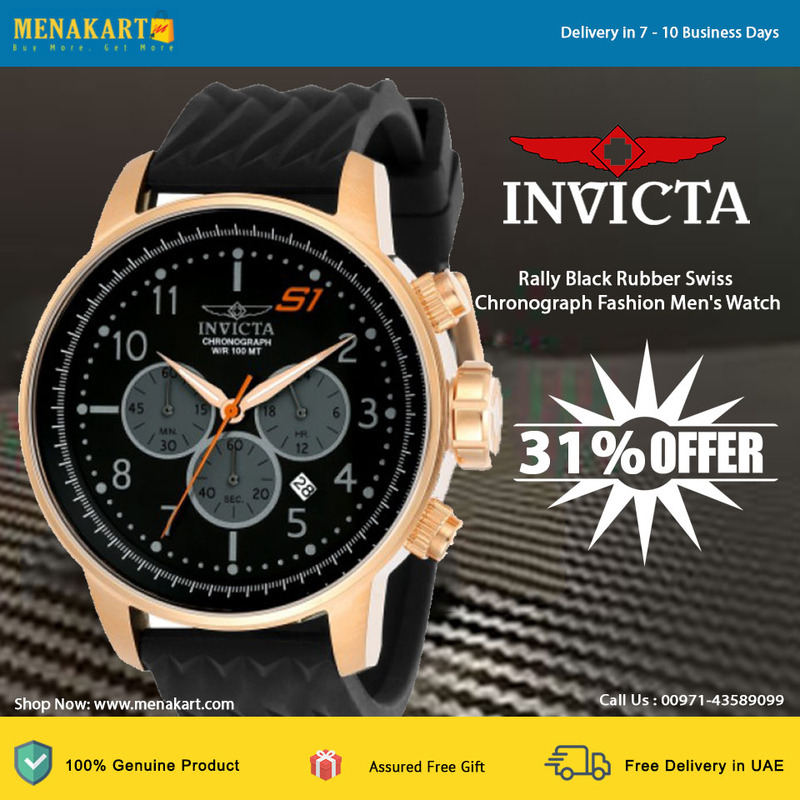 This Invicta watch prominently features an easily seen yet distinctive black dial with easy-to-read display and is powered by a swiss chronograph movement allowing a more accurate keeping of time beyond that of its nearest competitor. Special characteristics that make this one-of-a-kind watch stand out from the competition are features like tachymeter and chronograph. The simple beauty of the black rubber band paired with the stunning black face speaks volumes. This is a beautiful addition to any wardrobe with its synthetic sapphire crystal and 100 meters / 330 feet / 10 atm water resistance. The gratification you feel when you wear a Invicta timepiece is due to the timeless design and quality materials. From the sturdy synthetic sapphire crystal to the sleek rubber band this watch lets the world know you have arrived. The sleek design is accentuated by the black dial and complements any wardrobe choice. This Invicta men's watch features a stainless steel case and a silicone band. Black/gray dial with luminous rose gold hands and Arabic numeral markers. This handsome watch also features a quartz movement, analog display, date display between 4 o'clock and 5 o'clock, chronograph function and mineral crystal. Water resistant to 100 meters / 330 feet.